[prMac.com] New York, New York - Chromatic Bytes today announced a going back to school sale for their flagship vector drawing program, ZeusDraw. ZeusDraw goes back to school with a sale price of $59.99 from now until September 21. This is one third off the regular price of $90 USD. ZeusDraw is a vector drawing program with a fluid, graceful interface. 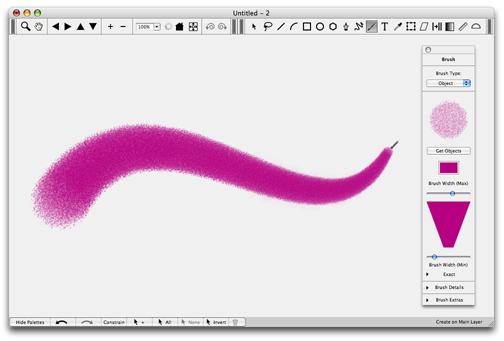 It has a different, more intuitive approach to paths (Bezier curves) and great brushes. Quartz lets ZeusDraw show you what you are doing, as you do it. When you move or rotate an object, you see the object move or rotate, not its bounding box. When you draw with a brush, you see a close approximation to the final brush stroke as you draw, not a dotted line that is filled in later. ZeusDraw works in English and German with French, Spanish and Chinese coming soon. German, French, Spanish and Chinese language sales and support provided by Danholt Consulting Services. Located in New York City, Chromatic Bytes, LCC makes Macintosh software for OS X and iPhone/iPod Touch applications, specializing in graphic arts software. Copyright 2008 Chromatic Bytes, LCC. All Rights Reserved. Apple, the Apple logo, iPhone and iPod are registered trademarks of Apple Computer in the U.S. and/or other countries.